Includes Internet access "For the 2016 specification"--Front cover. 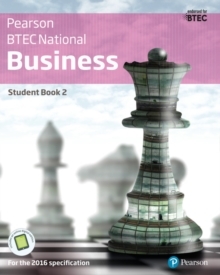 Updates to BTEC National Set Tasks for external assessment - April 2017As a result of feedback from the Department for Education Pearson have made updates to the Set Tasks for some BTEC National qualifications. Therefore subsequent changes have been made to this product. If you have purchased this book before 13th April 2017, details of these changes can be found here. [link to www.pearsonfe.co.uk/BTECchanges]. Corrected copies will be available to purchase by June 2017. Each Student Book and ActiveBook has clearly laid out pages with a range of supportive features to aid learning and teaching: * Getting to know your unit sections ensure learners understand the grading criteria and unit requirements. * Getting ready for assessment sections focus on preparation for external assessment with guidance for learners on what to expect. Hints and tips will help them prepare for assessment and sample answers are provided for a range of question types including, short and long answer questions, all with a supporting commentary. * Pause point features provide opportunities for learners to self-evaluate their learning at regular intervals. Each Pause Point feature gives learners a Hint or Extend option to either revisit and reinforce the topic or encourage independent research or further study skills. * Case study and Theory into practice features enable development of problem-solving skills and place the theory into real-life situations learners could encounter. * Assessment practice features provide scaffolded assessment practice activities that help prepare learners for assessment. Within each assessment practice activity, a Plan, Do and Review section supports learners' formative assessment by making sure they fully understand what they are being asked to do, what their goals are and how to evaluate the task and consider how they could improve. * Dedicated Think future pages provide case studies from the industry, with a focus on aspects of skills development that can be put into practice in a real work environment and further study.